Reason enough to crow a bit! The first book on the list of publications for 2006 was published, in fact, in late 2005, too late for inclusion in last year's article. 'Playing With the Hill' is the title of the G.A.A. history of the parish of Ballinahinch and Killoscully, the colour cover carrying an image of the famous Keeper, with a line of the club jerseys drying in the sun at its base. The cover also includes pictures of high points in the club's history, teams that won junior hurling titles and a junior football, as well as Club of the Year Award in 2002. John Ryan (left) the author of Ballinahinch G.A.A. club history "Playing with the Hill" receives a presentation from G.A.A. 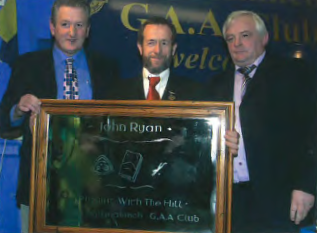 President Sean Kelly who launched the book and Ballinahinch Chairman John 'Rockie' McGrath. Leafing through this comprehensive history, covering close to five hundred pages, one is struck by the thought that although it is a small club, in the context of titles and honours achieved, it is just as big as any club in its commitment to the G.A.A., in the intensity of its support for its teams, and in the endeavor of its players, when they don the club colours and take the field for the honour of the parish. It is significant that President of the G.A.A., Sean Kelly, was present to launch the book, a statement in itself on the importance of every unit in the organisation, however small or, for that matter, however great they may be. This book is a labour of love for the writer, John Ryan, who spent a number of years gleaning the records and extracting any information that could be found about the game in the parish, and the achievements of Knockmeal, Shallee, Killoscully and Ballinahinch , as well as teams in faraway places. There are also accounts of boys from the parish in neighbouring secondary schools, on camogie, juvenile s, handball, etc. The large list of sponsors and patrons listed in the back is an indication of how much such a book means to the people of the parish. They got good value for money in the work of John Ryan. The book is no 'cut and paste' job as so many similar works tend to be, but a well-written and entertaining account. The work is also enhanced by a thoughtful introduction by the author's brother, Martin, no mean writer himself, on the role of the G.A.A. in Irish society. A model for any other club thinking of writing a history. A second club history was that of Cashel King Cormac's. In this case it was a second edition! The 'G.A.A. History of Cashel and Rosegreen' was published in 1884 and covered the history of the club to that period . It missed out on the glory days that came after that year so there was a need to bring matters up to date. Seamus King, who wrote the original work, has done just that with, 'Cashel King Cormac's G.A.A History 1985-2005', which was launched by Justin McCarthy, who contributed so much to the club's breakthrough to a county senior hurling final in 1991, at Cashel on April 28. The book is a substantial work of over three hundred pages, and it includes over four hundred pictures. It has a sixteen-page colour section. Part of its strength is a series of comprehensive profiles of some of the stars of the club, such as the Bonnars. Beautifully printed by Lion Print, Cashel, it retails at €20 and is available at Lar na Pairce as well as from the club secretary, Mattie Finnerty. Two publications of great importance to the county will make their appearance next year. Both the South and Mid divisions came into existence in 1907, following a decision taken at the county convention that year. The North division had already been declared in 1901, and the West wasn't to make its appearance until 1930. So, the South and Mid divisions will celebrate their centenaries in 2007 and it's understandable that both divisions would like to see their histories between covers. The result will be that all four divisions will have histories. As a result there should be no excuse for clubs not writing their histories. To date most of the groundwork for club histories has been done in the North and the West through the publication of their divisional accounts. The work has progressed to the late eighties in a chronological order , and Michael has found that the nearer to the present one comes, the greater the amount of information is available, as well as the greater the number of competitions, but also greater is the amount of work involved sifting through it. Michael has a committee of beavering individ uals who are working away on pen pictur es of important players and administrators in the division, as well as activities such as scor, hand ball, Bord na nOg, etc. The work is expected to reach 700 pages and will be published in September next in time for the centenary celebrations. Not so advanced is the Mid production, which is more ambitious. What set out to be a single volume history of the division, has evolved into two books, one of photographs and a second of text. It was hoped to have the book of photographs, an impres sive collection of about two thousand images, ready for the centenary, with the history itself coming on stream in 2008. However, at time of writing, there are concerns about the costs involved but, I understand, it is full steam ahead. The Mid are writing their history by committee, under the chairmanship of P. J. Maher and the editorship of Martin Bourke. The completed work is keenly awaited. A number of books that appeared during the year will be of interest to hurling fans. These include 'OLLIE - The Hurling Life and Times of Ollie Walsh' Written by Dermot Kavanagh, the book traces the career of one of the great goalkeepers of our time from his first success with Thomastown in 1947, when he was aged 10 years, to his last All-Ireland appearance in 1971. The biography is well served with photo graphs. It is published by Blackwater Press. A slim volume is 'The Man from Carron ', a sho rt account of the life and times of Michael Cusack by a great admirer, Brother Sean McNamara, which was published to coincide with the centenary of the death of the founder of the G.A.A. Published in association with Coiste Cumarsaide an Chlair and Coiste CLG an Chlair, it is available from the Ennis Bookshop for €11 including postage. costs €9.95 post free. The second is 'The Complete Handbook of Gaelic Games', which is a G.A.A. statistics book, containing all the records and facts that the G.A.A. follower need to know. It costs 19.95 euros post free. 'The Championship ' by Brian Carty has been appeari ng since 1995 and the 2006 edition brings you all the facts and figures relating to the football and hurling champi onships. An all colour book it includes every match with all the relevant statistical details. 'Dublin v Kerry: The Story of the Epic Rivalry that Changed Irish Sport', by Tom Humphries, Penguin Ireland, €22 .99/ £17.99 brings new life to an old story, the great rivalry between Dublin and Kerry, and between Kevin Heffernan and Mick O'Dwyer in the seventies. Very well written, the book is enlivened by plenty of stories and anecdotes. Gerry Slevin's book on Tipperary camogie from 1999-2005, called ' Years of Plenty ' was launched last December , too late for inclusion in last year's article. The book is lavishly illustrated by Bridget Delaney 's photograp hs. It captures the essence of these very successful years, which Gerry covered extensively for the 'Guardian '. The book highlights the great achievement of Tipperary in camogie 's Centenary year, when the county won the national league and the Munster and All-Ireland championships. Printed by the Guardian , the book retails for €20. I want to mention two match programmes. The first is that for the county hurling final on October 22. Apart from the information on the teams involved in the minor and senior finals, there is a six-page spread on the Roscrea teams from 1968-1980, who were celebrated between the games on the day. For this alone it is a collector's item. The second program was produced for the intermediate hurling final at Boherlahan on October 28. Compiled by county P.R.O. Ed Donnelly, it is chock-a-bloc with information of the teams involved, Eire Og, Annacarty and Moycarkey-Borris. Long after the game is forgotten, the program will be a source of plenty of reading. probably be available in time for Christmas.